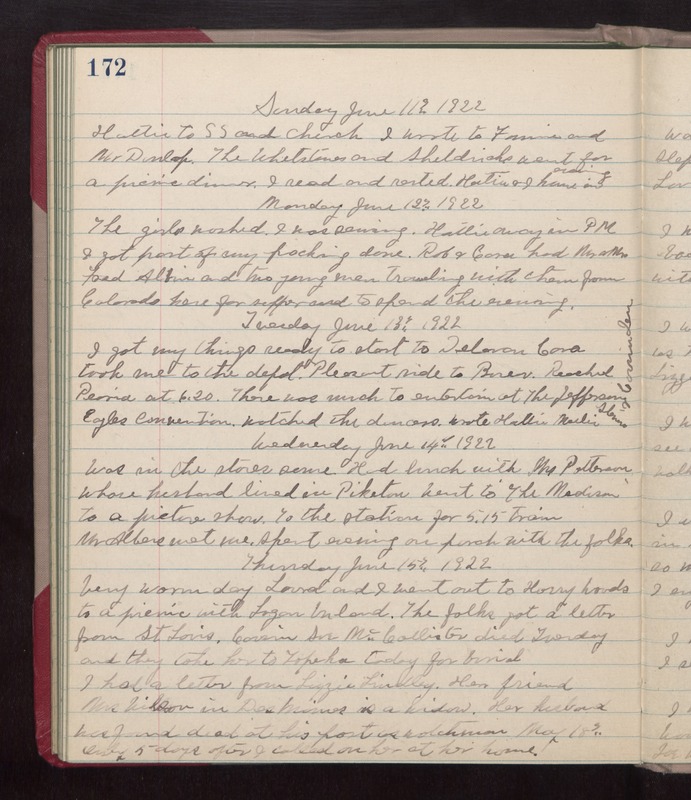 Sunday June 11th 1922 Hattie to SS and church. I wrote to Fannie and Mr Dunlap. The Whetstones and Sheldricks went for a picnic dinner. I read and rested. Hattie & I home in evening. Monday June 12th 1922 The girls washed. I was sewing. Hattie away in PM. I got part of my packing done. Rob & Cora had Mr & Mrs Fred Albin and two young men traveling with them from Colorado here for a supper and to spend the evening. Tuesday June 13th 1922 I got my things ready to start to Delavan. Cora took me to the depot. Pleasant ride to Bureau. Reached Peoria at 6.20. There was much to entertain at The Jefferson. Eagles Convention. watched the dancers. wrote Hattie, Martie Stevens, & Cousin Jen. Wednesday June 14th 1922 Was in the stores some. Had lunch with Mrs Patterson whose husband lived in Piketon. Went to The Madison to a picture show. To the station for 5.15 train. Mr Alber met me. Spent evening on porch with the folks. Thursday June 15th 1922 Very warm day. Laura and I went out to Harry Woods to a picnic with Logan Urland. The folks got a letter from St Louis. Cousin Sue McCallister died Tuesday and they take her to Topeka today for burial. I had a letter from Lizzie Lindley. Her friend Mrs Wilson in Des Moines is a widow. Her husband was found dead at his post as watchman May 18th only five days after I called on her at her home.